The quick and dirty guide. Left to right: Eleven, King Tut, and Axl Rose. Photo by Maria Wachter. Have a horse? You probably also have a barn full of corners and crevices and horse feed, which also means you likely have mice. Have mice? You probably also have a barn cat. Just in case you’re trying to discern the difference between a house cat and a barn cat, here are ten easy indicators. 1. A house cat prefers Fancy Feast; a barn cat would rather eat mice (or steal your lunch when you’re not looking). 2. Most house cats are afraid of their own shadow. Barn cats like to kill snakes. 3. House cats want to be left alone so they have time to plot your demise. Barn cats would climb in your pockets if you’d let them (mostly so they can get close enough to steal your lunch when you’re not looking). 4. House cats leave you hairballs on your pillow. Barn cats leave you lizards and chipmunks. 5. House cats like to play with mice… barn cats like to dismember. 6. House cats use their litter box. Barn cats use your arena. 7. House cats need a sitter when you go on vacation. Barn cats do the sitting for you. 8. People dissuade their house cats from sharpening their claws on the furniture. People encourage their barn cats to hone their claws. 9. House cats can be bred with fancy pedigrees and flat faces. 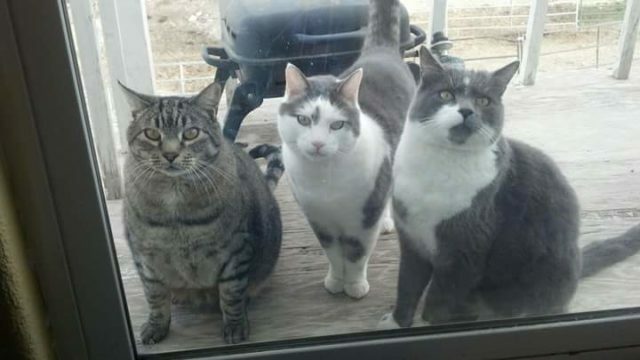 Barn cats… you get what you get. 10. House cats smell clean and fresh… barn cats on the other hand smell mostly like a mixture of dead things and dirty shavings. Here’s to all our feline friends inside and out!